Marks and Spencer left some of their male customers in a bit of an awkward situation after they shortened the fly zip on some of their chino trousers by one inch. Unfortunately for a number of guys this change caused a few logistical difficulties when they attempted to go to the toilet. 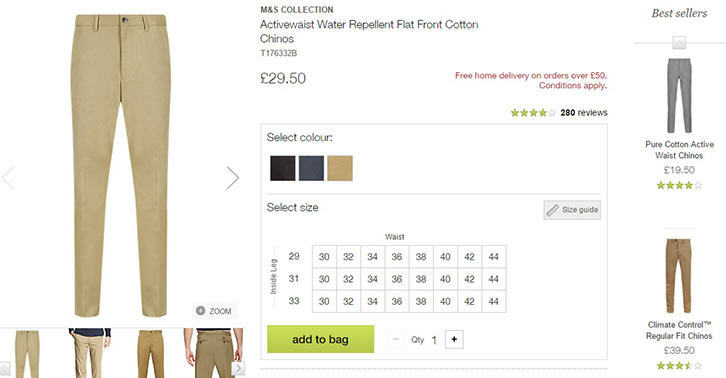 The unfortunate lads took to social media and the company’s website to complain to M&S after discovering the issue with the £29.50 Activewaist Water Repellent chino trousers. And, given how difficult it apparently is to pee while wearing these things, we’re starting to understand why these particular pants might be waterproof! The zip finished one inch higher than previously. To be precise the crotch-to-zip measurement was two inches for years and years and now it’s three inches. They have created what might best be described as a logistical problem for us chaps. Is cost cutting the reason? I have been wearing the same chinos for 30-odd years with no problems so who decided to make the change? Male or female? Sadly nobody seems to have considered the implications. Simon wasn’t the only person to complain, as the M&S site was inundated with bad reviews for the trousers. A spokesman for Marks & Spencer admitted that a small batch of chino trousers had been made with shorter zips and the problem had now been dealt with. We had a very small number of customer complaints. We addressed this quickly and the zips are now back to the standard length.